It feels like eons ago when I made my first batch of elderberry syrup. I made it, LOVED it, and loved how it helped to keep my family healthy despite my mother-in-law catching and bringing “the crud” at her 50th high school reunion to our house even more. You guys loved it too, but I kept getting the same question over and over again: How can we make these into gummies? 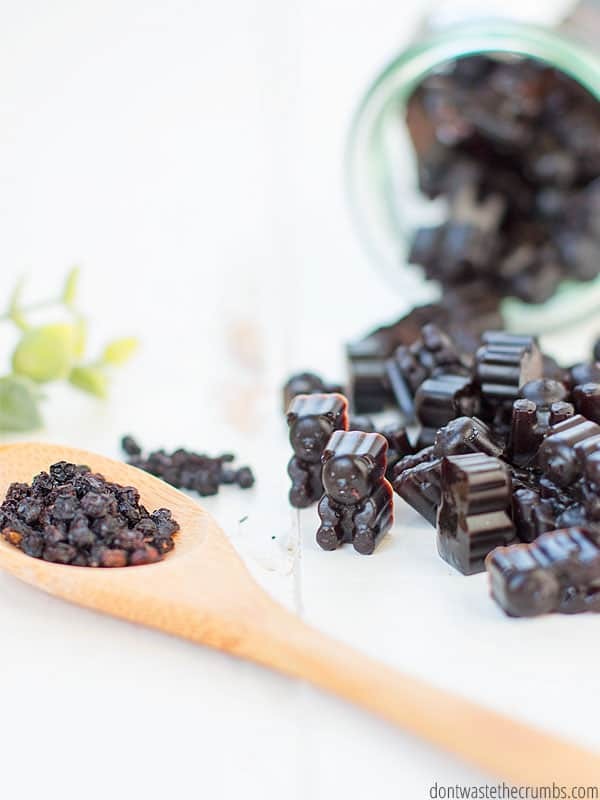 Friends, let me show you how to make elderberry gummies! Making elderberry gummies is SO easy. Really truly, you’re going to make these and then kick yourself for not making them sooner – they’re THAT easy. But before I give you the tutorial, let’s talk about WHY you should make elderberry gummies. Which is better: elderberry gummies or elderberry syrup? The answer is elderberry gummies, by a smidge. 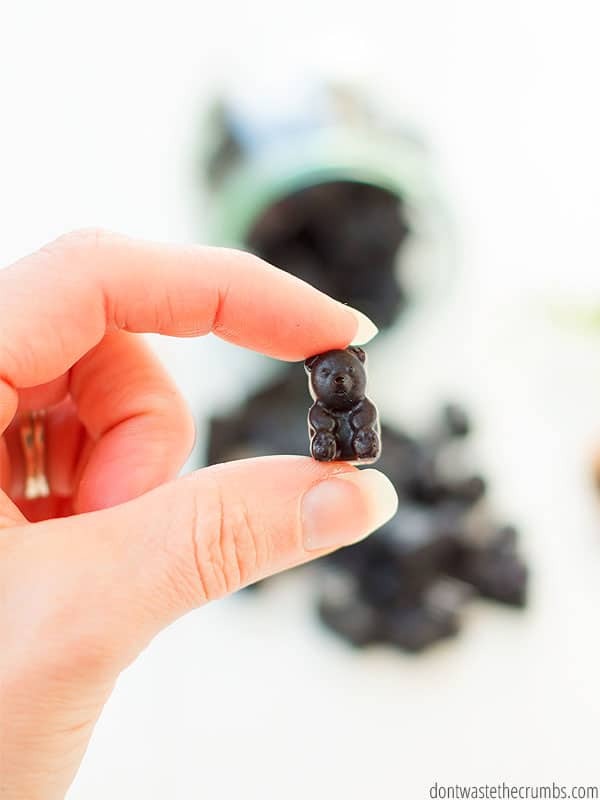 Both the gummies and syrup are based on immune-boosting elderberries, and all of the good stuff you find in the syrup is in the gummies, too. 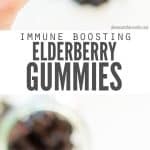 But elderberry gummies also contain gelatin, which is CRAZY good for you. Do you remember the health benefits of collagen? They help your hair grow long, your nails grow strong and your skin becomes super healthy. 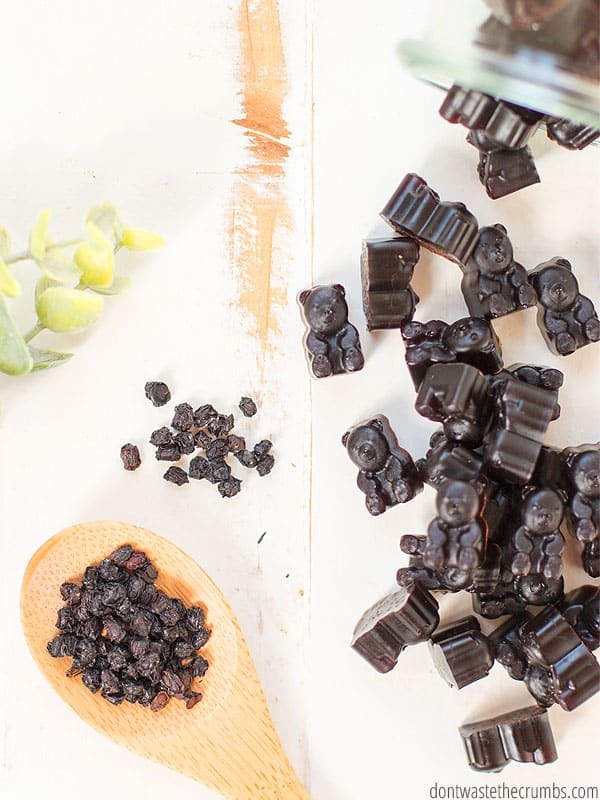 Gelatin is cooked collagen… so that means when you make elderberry gummies, you’re not only getting the benefits of elderberries, but you’re getting the benefits of collagen too – SCORE! How many elderberry gummies should you take? It depends on a couple different factors, the first being the size of the gummies you make. If you use a big LEGO mold like this one, you’ll get big gummies. You probably only need half or one gummy each day. If you use the cute little bear molds like this one, and like the ones I made in these photos, you’ll need more than one for sure. And if you’ve wondered if elderberry gummies work, just read how effective the syrup was!! Before you can make elderberry gummies, you need elderberry syrup. I HIGHLY recommend NOT running out to the store to buy Sambucal elderberry syrup. It’s overpriced ($9-10 for 4 oz! ), it contains ingredients you don’t need (including artificial sweeteners like fructose and sucrose) and it’s really super easy to make your own without sugar or corn syrup. To warn you, the price of dried elderberries might give you sticker shock. But hear me out – I bought this one pound bag two years ago, have made no less than four batches of elderberry syrup and I STILL have enough left for another cold and flu season. One batch of elderberry syrup uses 2/3 cup of dried berries. One batch makes about 12 ounces of syrup. So you can make 6 batches of syrup with a one pound bag. That means if I pay $29 for a one pound bag of dried elderberries (the cost as of this posting), I’m paying just $1.83 for four ounces of elderberry syrup. That means you’re SAVING $8-9 over buying Sambucol at the store!! Make sure you’re buying dried elderberries when it’s NOT cold and flu season. In the fall, I’ve seen dried elderberries go for as much as $50 per pound! In the winter and spring though, I’ve seen them for around $20 per pound (the price right now). But… what about the gelatin, right? Because we know how much honey costs and how much ginger costs and how much cinnamon costs (even though both the ginger and cinnamon are optional). The real kicker is going to be – how do we save on the gelatin? The same way we do on everything else: we wait for a sale and buy in bulk! NOTE: I get both my collagen and gelatin from Perfect Supplements. I once did a side-by-side testing of their collagen and another popular brand and there was absolutely no comparison. That was a couple years ago now and I’ve never looked back! I’ve been taking Perfect Supplements collagen every day since then, and LOVE the results. Even my husband and hairdresser comment about my weight, my skin, my hair and my nails! As the saying goes, “the proof is in the pudding,” and that’s why I buy my gelatin (which is cooked collagen) from Perfect Supplements too. I don’t trust anyone else! 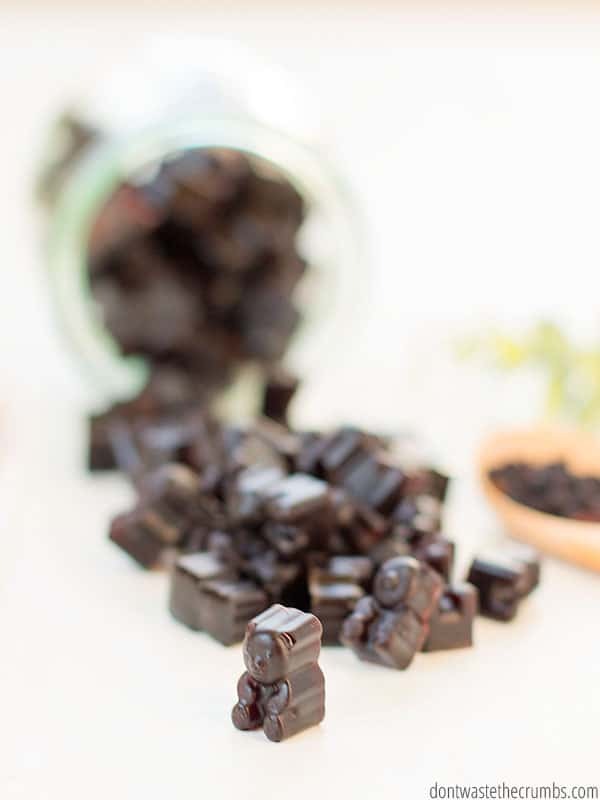 Once you’ve made elderberry syrup, you can make elderberry gummies! In a small saucepan, gently warm elderberry syrup over medium low. Add the gelatin and use a flat whisk to thoroughly dissolve the gelatin. The gummies will begin to gel within a few minutes, but they are easier to remove from the mold after they have been in the fridge for 2-3 hours. When the gummies have completed solidified, remove from the molds and store in the freezer for 6-12 months. Use the dosing guide above, or as desired! Do you or your family take elderberry syrup? 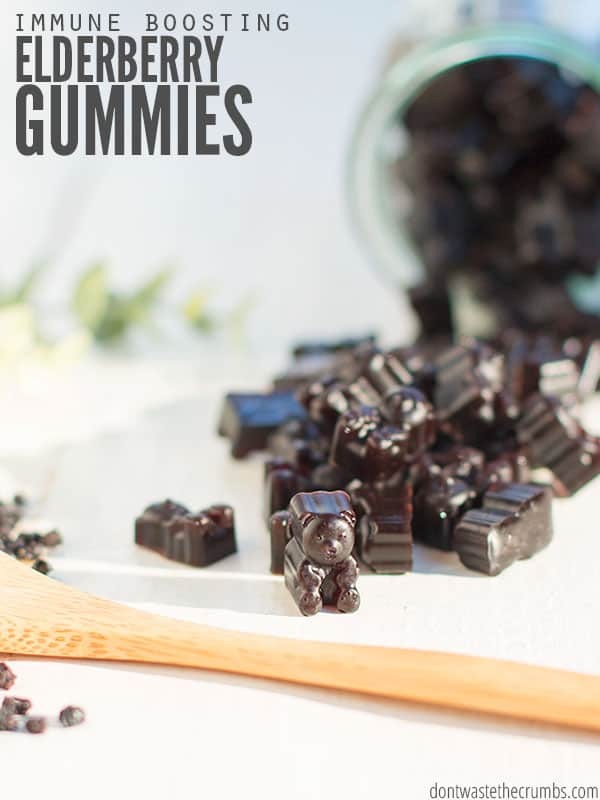 Have you ever made elderberry gummies before? I’d love to hear how elderberries have helped you and your family stay well – please leave your stories and ideas in the comments section below! Thanks for the tips on purchasing dried elderberries! So, when you aren’t sick but have come into contact with someone who is, you take fewer gummies? Just wonder if that’s a typo. I have just discovered elderberry this year and want to try this. Thanks for the post! When we aren’t sick but come into contact with someone who is, we take a few more. I’ll clarify that!! You’re so very welcome Kathryn!